There are countless millions of websites on the Internet and most of them are varying degrees of bad. Many are not so bad. A few are really quite something special. And others are just downright awful. But what makes a website worse than awful? 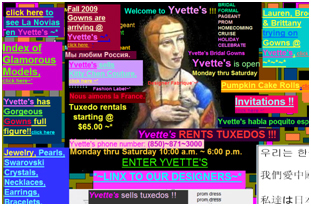 How do you cross the threshold of terrible website design? 1. Animated GIFs; and lots of them. Definitely at the top of the list of disgraceful web design is the overuse of stock animated graphics. 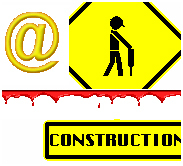 We have all seen them – the spinning ‘at’ logo, the dripping blood bar, and the ‘under construction’ sign featuring the man perpetually digging. Under no circumstance should you ever include a stock animated image on your website. There are 16.7 million colours to choose from when designing your website. It’s probably best that you don’t use them all at once. Over saturating your website with colours not found in even the largest rainbow will simply make your visitors physically ill. Unless this is your goal, stick to a handful of colours only. 3. Music that cannot be stopped. Even MySpace has since worked this out. Do not play music on your website unless the user presses the play button his or herself. If you must include the capability to play music make the player easy to locate on the page. There is not much worse than getting two paragraphs into the main text of a website before being hit in the head with a bad MIDI recreation of Queen’s Bohemian Rhapsody. 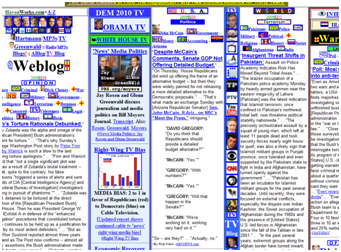 Back in the early days of the web you didn’t have much choice when laying out your content for the web. Modems were slow so the use of imagery was limited. We are in the broadband age now and imagery, in moderation, can aid websites usability to no end. There is not much more off-putting than a website that slams the first three volumes of the Complete Encyclopaedia onto the landing page. Where do you start? You don’t – you leave. If you have a lot of things to say split your content into a hierarchical page structure with easy to use navigation, paging and search facilities. There are one and a half million websites (according to Google) featuring the term ‘hompage’. Lazy spelling is the bane of the Internet and makes your otherwise interesting and thought provoking blog the product of a six year old. It is not hard to check your spelling – at the very least copy and paste your content into Microsoft Word and look for the red squiggly underlines – and the web as a whole will be better off for your thoroughness. These 5 suggestions are the tip of the iceberg. There are more DON’Ts than DO’s when it comes to good web design. Please be sure to think of the children before unleashing your latest Netscape Composer atrocity! View Next blog Why undertake a competitor analysis on the web?